Barnum Hall Theatre was built in 1937 by the Works Progress Administration (WPA) as a cultural magnet for the Santa Monica community to host events such as concerts, plays, musicals, opera, and ballet. Originally known as "The Auditorium", the theater was designed by the architectural firm of Marsh, Smith & Powell, who were responsible for many Southern California landmarks, including Grauman's Chinese Theater, Hollywood High School, and South Pasadena High School. Barnum Hall is a textbook example of the Streamline Moderne style and was deemed one of the finest Art Deco theaters of its time upon completion. 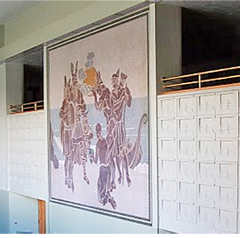 Among its many defining features are the 15 ' x 17 ' tile mosaic mural in the lobby ("The Landing of the Vikings in Vinland") and the colorfully painted stage fire curtain mural entitled "Entrance of the Gods into Valhalla". 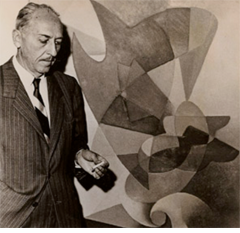 Both pieces are the work of internationally recognized artist Stanton MacDonald-Wright and were funded and completed as part of the WPA relief program. A stylized concrete bas-relief of a comedy-tragedy mask and musical instruments, created by artists Ella Buchanan and Stefan de Vriendt, crowns the large bank of windows on the theater's front facade. In 1944 The Auditorium was renamed Barnum Hall and dedicated to the memory of Samohi's distinguished former principal, William F. Barnum. 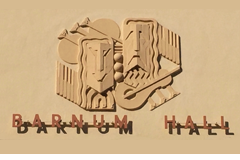 After the Santa Monica Civic Auditorium was built in the late 1950's, Barnum Hall was no longer in demand as a community venue and fell into disrepair. By the 1990's the theater was considered unsafe and was closed. Luckily, the citizens of Santa Monica recognized the value of this unique architectural gem and Barnum Hall underwent an extensive renovation from 1999 - 2004, with funding from local and state bond measures and nearly $1 million dollars in donations from the community and Samohi alumni. That work returned Barnum Hall to its place as one of the premiere mid-size auditoriums in the area. Among the outstanding features of the interior are its 1,250 seats, rich carpeting, concealed lighting, and a full complement of stage equipment. The size of the stage and the extensive equipment permit the production of all types of dramatic, musical, and dance performances. The final piece of the renovation was set in place when a restored 1921 Wurlitzer Theatre Pipe Organ was installed in Barnum Hall to replace the original that was destroyed in the 1994 Northridge earthquake. Material for this article was adapted from "A History of the Santa Monica Schools" by Donald M. Cleland and "Queen of the Setting Sun: A History of Santa Monica High School" by Bob Holliday. Comedy-Tragedy mask bas-relief by Ella Buchanan and Stefan de Vriendt, located above the entrance on the front facade.